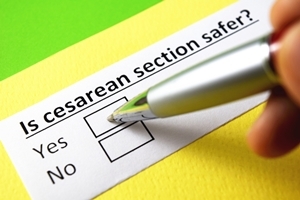 In a major change, a study published this week in the Journal of the American Medical Association (JAMA) says that higher cesarean section rates prove to be safer than first thought. JAMA released the article and an editorial announcing the study results in their December 1, edition. Through this study, JAMA has shown the usefulness of C-sections while also reminding readers of the risks related to a hospital’s environment. For years, insurance companies and hospitals have insisted that the cesarean section rates were too high and pushed doctors to lower the C-Section rates. Even the World Health Organization (WHO) previously recommended that C-section rates stay between 10-15 per 100 live births. In this new study, the authors found that a C-Section rate as high as 19 percent per 100 babies was safer, resulting in less mortality to moms and babies. Up until now, hospitals and insurance companies were striving for a C-Section rate as low as 10 percent per 100 babies. In addition to these findings, JAMA’s study recognizes that conditional factors also affect the success of a C-section. Although a C-section may often save the lives of both mom and baby, it is still a risky surgical procedure. The hospital’s cleanliness standards, surgical procedures, and level of technological advancement all contribute to mortality rates and should be considered on a case-by-case basis. If your doctor recommended and performed a C-section that ended in injury to you or your baby, you may have serious questions. The team at the Holton Law Firm is here for you. We can answer your questions, consider the details of your case, and help you pursue compensation. Contact us today by starting a live online chat on our website.